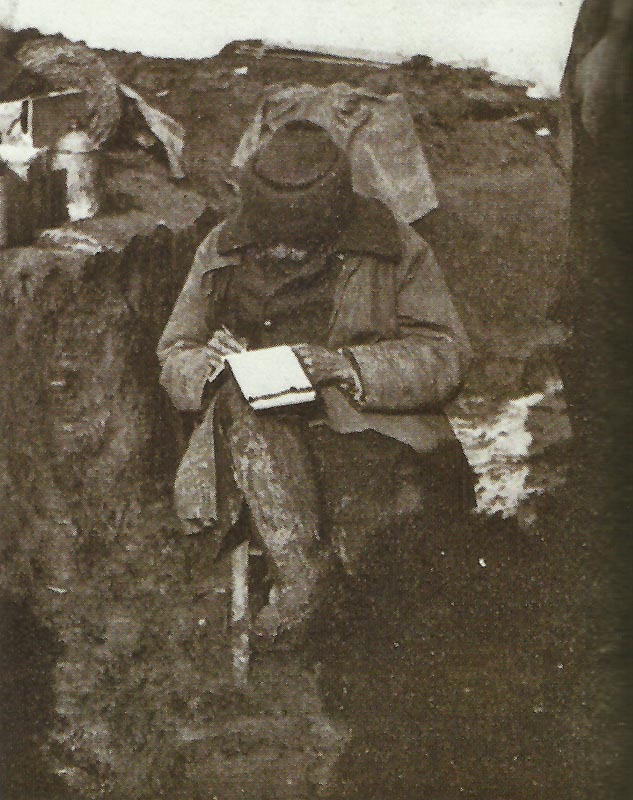 Even simple tasks such as writing home were turned by the mud and cold in Flanders into a major operation for this British soldier. Flanders: British 27th Division regain lost ground at St Eloi, repulse fresh German attack on March 17. Aisne: General Maunoury of Sixth Army severely wounded (partially blinded), aged 67, out of war except as military governor of Paris. Mediterranean: Germans decide to send coastal u-boats UB1 and UB8 in sections by rail to Austrian Pola naval base (assembled by c. April 10) and a large U­-boat by sea to Dardanelles, U21 selected on March 17, Kaiser approves on March 30 (UB3 transferred by rail on April 15). Britain: Admiralty orders 15 Z Whaler type patrol craft, finished by November, based at Peterhead, Shetlands and Stornoway. North Sea: First German air attack (bomb misses) on British merchant ship (SS Blonde) in home waters (3 miles off North Foreland). Britain: Government reply to U-boat blockade issued, Dedeagach in Bulgaria declared as an enemy base. Germany: Compensates USA for sinking of William P Frye.